Over the last year, Culturebaby has truly fallen in love with Peter Rabbit, his green and beautiful Lakeland habitat, his rabble of friends, his mischief-making. I have no doubt she sees a kindred soul in the cheeky chap. I've also merrily left my potentially purist sensibilities at the door of the TV room and concede, that alongside a selection of engaging and simple introductions to the book produced for tots, it is the animated spin-off Peter Rabbit and Friends that has drawn her into the world of Hilltop and enticed her into the more complicated language of the original Potter Classics. Mr Tod, Old Brown and Tommy Brock are often found, to her delight, lurking amongst the bushes in our local nature reserve - models hastily deposited by Culturedad sprinting ahead in a circuit and returning with a makeshift treasure map. They've also featured in our recent Winter imaginative play scene. Helpfully, on many an occasion, it is also the reminder that Peter Rabbit is prepared to risk everything for the taste of a particular vegetable that has prompted a preliminary nibble from my faddy eldest bunny. With that in mind we were delighted to be asked to be part of the Happy Feaster Blog Tour by the wonderful publisher Ladybird Books and The Happy Foodie. We were challenged to take storytelling from the page to the kitchen by creating a Spring recipe inspired by the Tales of Peter Rabbit. Now as readers will be well aware, the culinary arts are not really my forte; however, one of the few recipes that I managed to master before I was propelled headlong into the throes of domestic necessity with the arrival of my own little bunnies was an inherited dish from my mother, rooted in her Russian and Polish background. Happily this soup is simple to create, packed with vitamins, and could be created entirely from ingredients snaffled during an illicit foraging spree by a little bunny on the loose in Mr McGregor's vegetable patch. 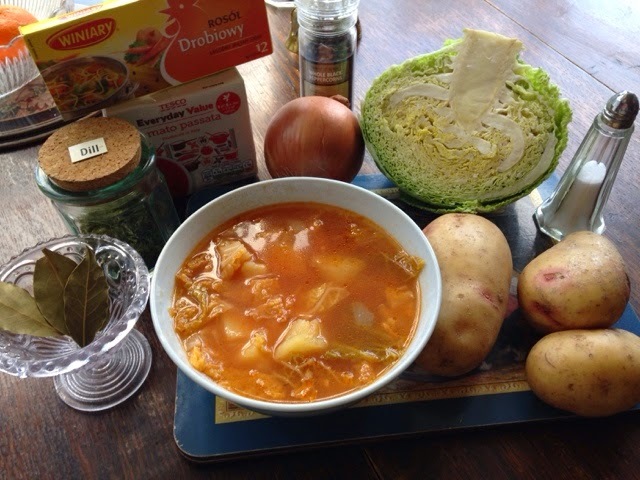 The dish is essentially a cabbage soup 'shchi', but when my mother grew up it was known by the community as 'borscht'. When I mention this soup people often refer to beetroot, and a different version can be made with this ingredient, but often it was created by the polish and Russian communities with a tomato base. This is how I love it, and I'll make sure I pass it down in this form to my girls too. 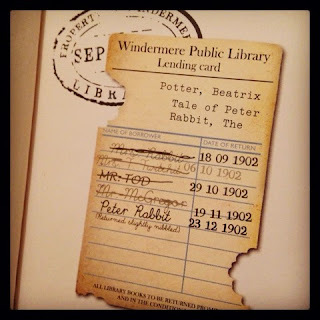 It was lovely to receive, as part of this blog tour, a little selection of new Peter Rabbit titles to prepare us for our annual holiday to Potter's heartland, the Lake District. We've visited her beautiful home Hilltop on many an occasion (and with Culturebaby at a few months old), but we can't wait to take her back this year as she'll really appreciate and remember it. Whilst this was not the original inspiration for Peter's favourite foraging grounds, it certainly could well have been with its rambling gardens and well-stocked vegetable patches. Last year we also had a great trip to Wray Castle, the (now) National Trust mansion where Beatrix first experienced the Lakes. Unsure what to do with this Victorian oddity, the Trust have turned the castle into a playground, including installing a Peter Rabbit experience especially for families to enjoy. I'm sure Beatrix Potter (whose work supported the foundation of the National Trust) would have very much approved. (For a great suggested walk and boatride to the Castle that we managed with a pram, see here). The literary goodies in our postbag included a couple of great introductory guides to the creatures of Potter's imagination and a cool retro "complete and un-nibbled" edition of the original tale, published to celebrate the 80th Birthday of Penguin Books. 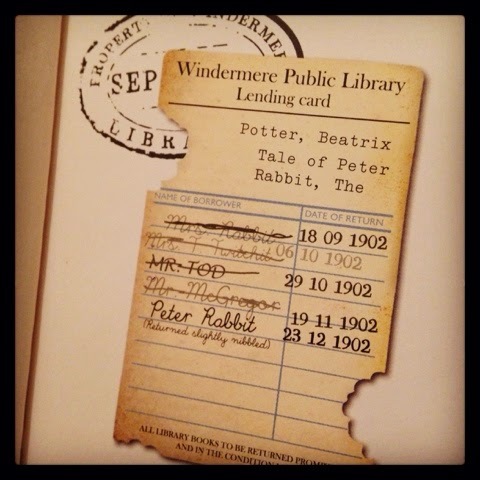 I love the little features such as the quirky library lending card in the front cover and the bitemarks at the rear. I'm a big advocate of introductory editions to more complicated classics and employ a host of early myths and tales in pictorial form as an introduction to longer classic titles. 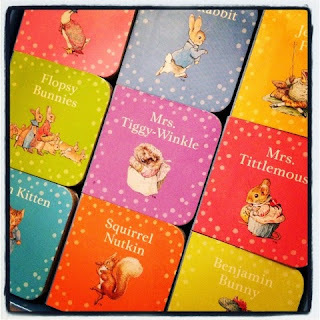 These serve as an effective way to ensure that characters and simple storylines become familiar long before our own little bunnies are ready for the Edwardian language of the original. A favourite in our household was the touchy-feely lift the flap book Peekaboo Peter. 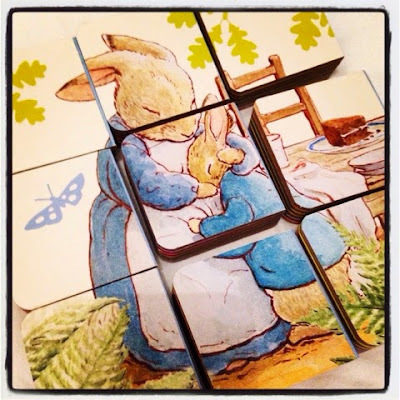 This and the new Peter Rabbit Big Box of Little Books are great for one year old Culturetot. 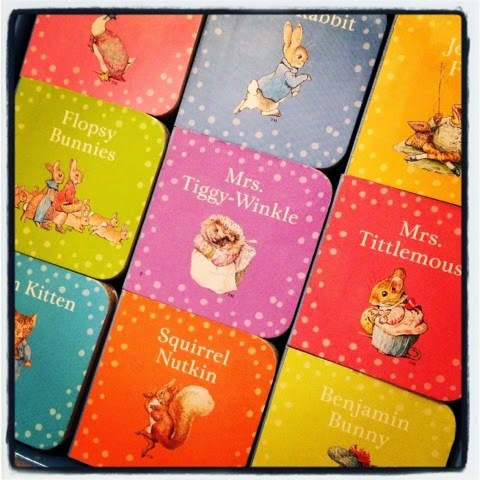 This collection of nine miniature board books, introducing some of the major characters in Potter's tales is perfect for little paws to handle. The titles are colourful and simple, feature original artwork and can be read, stacked and even form a puzzle when turned over. They are ideal for the girls to explore together. 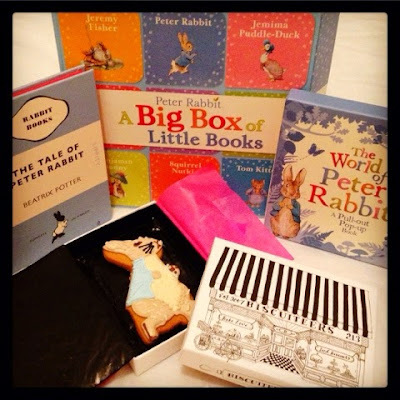 Culturebaby is also currently a big fan of pop-up books so The World of Peter Rabbit Pull-out Pop-up went down very well. Fold-out books also serve as brilliant backdrops for imaginative play scenes. Following on from our series of 'pretend' museums, I can well imagine this title will be commandeered for play very soon. For more Spring recipes, inspired by Peter Rabbit and friends, why not head over to The Happy Foodie and discover how celebrity chefs and their children are joining in. You can also pop over to see some of the other great recipe ideas featured on blogs on this tour. So far we've seen yummy Mr MacGregor's Mud Carrot Cupcakes and Peter Rabbit themed Cupcakes and look forward to seeing what EmmysMummy creates tomorrow as next stop on the tour.